There are many reasons why I love my husband! However, very early on in our relationship, he made it very clear that he was the king of baking and sweet treats! This gave him major boyfriend brownie points! 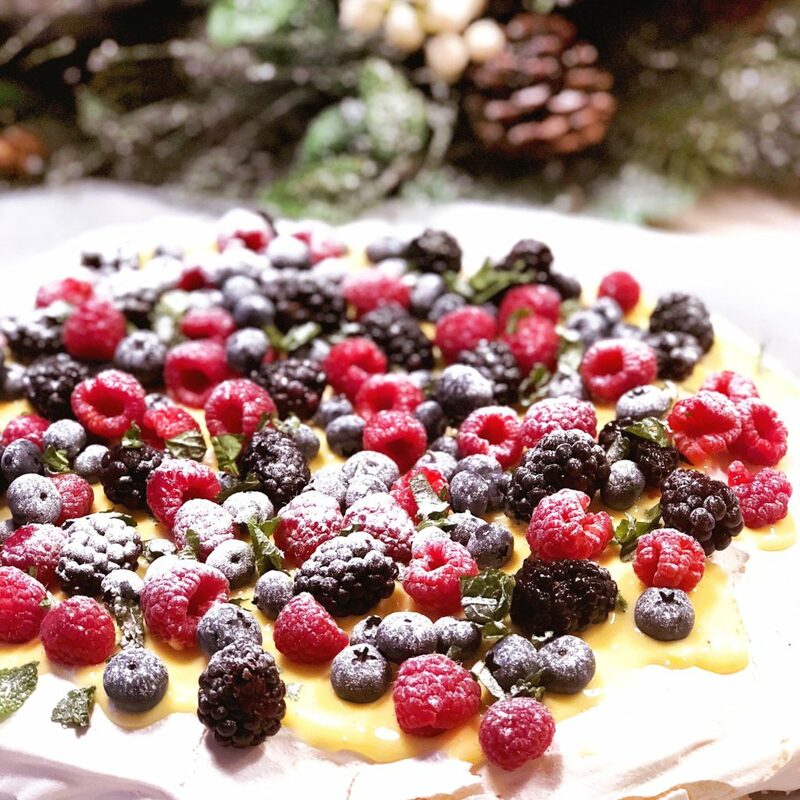 So here is his Christmas Pavlova … it is totally yummy and the perfection of this is that the meringue will always be gorgeously light on the inside, with a beautiful crunch on the outside! This is dairy free because he tops it with his dairy-free lemon curd meaning there’s no need for cream! Meaning I can eat the whole thing if I wanted to! (I have never done this …I have totally done this!) And even better the lemon curd recipe uses up all the egg yolks that are leftover! Let’s Cook It! – If you have an electric whisk it makes the process a whole lot easier! Add the cold water to the egg whites. Beat in. They will lose their peak and will be soft peaks now. Add the sugar a little bit at a time, whilst still beating. Add the rest of the ingredients whilst still beating. Put the mix on a piece of grease proofed paper and bake at 110℃ for 1 hr and 15 minutes. Once the time is up turn off the oven but leave the meringue in there to cool for at least 30 minutes. Once it is completely cool you can assemble your pavlova. Spread an even layer of lemon curd over the top. The curd is very sweet so do this to taste if you don’t have a very sweet tooth! You can use a whipped cream if you can eat dairy! Sprinkle a selection of berries over the top. Mike uses blueberries, blackberries and raspberries. For the final flourish add some sprigs of fresh mint and sprinkle a little icing sugar over the top. Next Post Project Pick me Up | Week 3 … the one where I party!